How to Fix ActiveX Error 429 on Windows? 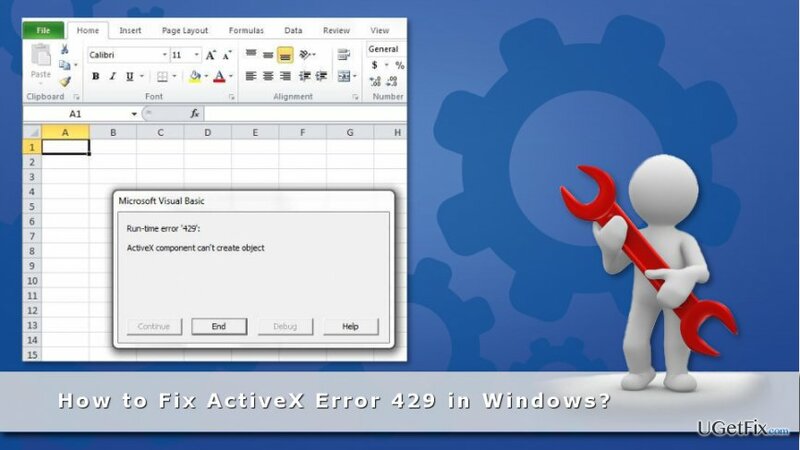 Home »	Fix » How to Fix ActiveX Error 429 on Windows? Issue: How to Fix ActiveX Error 429 on Windows? I was working with Excel, and it crashed. I was forced to close the program and received “Run-time error ‘429’: ActiveX component can’t create object.” error. I thought it was a one-time problem. However, it has occurred few more times. Is there something wrong with my computer? Many different issues can cause Active X Error 429, so there’s a bunch of ways to fix it. 1. Login to Windows admin account. 2. Open Run application by pressing Win key +R. Active X Error 429 might occur due to the corrupted or deleted file. If the error message states that there’s a problem with .ocx or .dll file, you should reregister it. Windows 10 and 8: Press the Win key + X -> choose Command Prompt (Admin) from the appeared drop-down menu. Windows 7: Open Start -> Type “cmd” in the Windows search box -> choose necessary result. 2. When in Command Prompt, enter the name of the corrupted file, for instance, regsvr32 Filename.ocx or regsvr32 Filename.dll. 3. Replace the filename with the specified title. 4. Click the Return key for file reregistration. Corrupted system files might be the reason of ActiveX Error 429. In order to fix it, you have to run the System File Checker that is an inbuilt feature in Windows. 1. Enter “cmd” in Windows search box. 2. Right-click on the Command Prompt and choose Run as administrator option. 3. In the Command Prompt type sfc /scannow and click the Return key. Since then, the ActiveX 429 issue should no longer bother you. You can easily copy or rename long path files errors by a program named "Long Path Tool. Hope that helps.